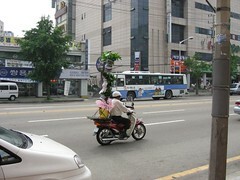 Question: if you buy a six-foot tall tree in Korea, what's the least sensible way of getting it home? But it may be a sign that I've been here long enough that when I saw said tree heading in my direction through the traffic at rapid speed I wasn't even particularly surprised. Personally - if only for sheer height - I think this tops the guy with a large quantity of plastic sheeting behind him, and for absurdity seems on a par with delivering LPG canisters by bike. But for the ultimate in motorcycle delivery, you can always change from two wheels into three.